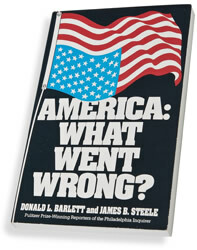 America: What Went Wrong? is a solid indictment of how the rulemakers in Washington and the dealmakers on Wall Street have changed the rules of the game to favor the privileged, the powerful, and the influential — at the expense of everyone else. Expanding on an unforgettable series of articles in The Philadelphia Inquirer, this book is the culmination of two years of research by Barlett and Steele. Assembling over 100,000 pages of documents and interviewing men and women at all levels of the work force across the nation, Barlett and Steele have managed to tell the story we all suspected in language so clear — and graphics so dramatic — that every reader will see how the lives of all of us have been touched by public acts and private greed. America: What Went Wrong? is a gripping portrayal of the painful dismantling of the American middle class.